100 young aspiring models have moved one step closer to making their dreams of walking international runways for the world’s biggest designers a reality. 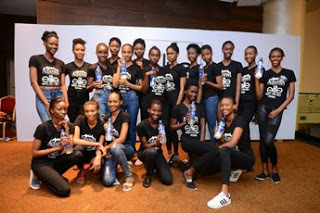 The aspiring models who showed up for the Aquafina Elite Model Look 2017 National Casting on August 26 2017 were screened by a judging panel which included Elizabeth Aisien, Creative Director EMLN, and 2014 EMLN winner, Victor Ndigwe. Davidson Obennebo, the 2016 winner of EMLN was also present at the event. The 21 year old who went on to win the global edition of Elite Model Look spoke about his experience as the first person of colour to win EML International while answering questions from the audience. Aquafina’s goal is to showcase Nigerian talent in the modelling and fashion industry and offer aspiring models the opportunity to start a career in modelling from the same launching pad as models like Cindy Crawford, Gisele Bundchen, Mayowa Nicholas and Victor Ndigwe. The lucky contestants preselected at the event will have their images sent to Paris where 20 finalists will be selected, according to Elizabeth Aisien, the Creative Director of Aquafina EMLN. The winners of the Aquafina EMLN 2017 will go on to represent Nigeria at the Elite Model Look International world finals. They also stand to win a modelling contract with Elite Model Management Worldwide.